The Importance of Addressing Rumination and Worry in Clinical Presentations: How Do We Formulate it in Schema Therapy? Rumination is defined as the process of repeatedly focusing on one’s present distress, as well as its causes, meaning and consequences (Papaeorgiou & Wells, 2004). In contrast, worry is defined as ‘passive, repetitive thoughts about future negative events with an uncertain outcome’ (Papagreorgiou & Wells, 2004).Both cognitive processes have considerable clinical significance, and are thought to be central to the development and maintenance of depression and anxiety disorders respectively (Watkins & Moulds, 2005). An increasing body of evidence suggests rumination and worry are transdiagnostic constructs, found to be elevated in chronic cases of psychological disorders across the board (Teasdale & Barnard, 1993), including personality disorders (Martino et al, 2015). Moreover, rumination and worry are associated with poor treatment outcomes, and are both a common residual symptoms after treatment remission (Jones, Seigle and Thase, 2008). Traditionally, worry and rumination have been perceived as distinct cognitive constructs, differing in both thought content (worry involves themes of anticipated threat, rumination focuses on past loss or failure) and temporal orientation (worry is future and rumination past oriented; Papagreorgiou & Wells, 2004). Yet emerging evidence suggests these constructs share more similarities than differences. Both are repetitive, difficult to control, negative in content, predominantly verbal, relatively abstract, and strategies in response to initial intrusion (Watkins & Mould, 2005).More recently, Nolen-Hoeksema & Watkins (2011) have proposed a transdiagnostic model, in which rumination and worry are part of the same underlying process of Repetitive Negative Thinking (RNT), which does not vary once controlling for disorder-specific content. Multiple findings support this model, namely that worry and rumination have been found in individuals with either a mood or anxiety disorder, and did not differ depending on the disorder (McEvoy, Moulds &Mahony, 2013). These findings elucidate why treatment specifically targeting this construct has been found to reduce both disorders, indicating that this over-arching construct may add increased clinical utility (Nolen-Hoeksema & Watkins, 2011). Figure 1 below demonstrates that repetitive negative thinking can be placed on a time continuum with past oriented thinking (rumination) on one end, and future oriented thinking (worry) on the other. There is general consensus in the CBT literature that repetitive negative thinking (rumination and worry) serves an avoidance coping function. Experiential avoidance is defined as both an unwillingness to remain in contact with aversive private experiences, and action taken to alter events that elicit them (Hayes, 2004). Borkovec and colleagues’ have put forth a model which proposes that worry is an experiential avoidance strategy which functions to reduce experiencing the full impact of fear imagery associated with anxiety(Borkovec, Alcaine, Behar & 2004). Worry is a predominantly linguistic strategy, and verbal articulation of feared material causes less sympathetic nervous activity than imagery (Shearer & Tucker, 1981). Worry is also characterised by abstract thinking, which produces less vivid and frequent images, and is thus less likely it is to evoke somatic responses than imagery (Borkovec&Ruscio, 2001). Thus, by switching attention from fear imagery to worrying (a verbal-linguistic activity), individuals with anxiety suppress autonomic arousal, negatively reinforcing this verbal-linguistic behaviour.Similarly, rumination is a linguistic strategy, characterised by abstract thought (Papaeorgiou& Wells, 2004). Significantly, experiential avoidance predicts unique variance in depression scores (over and above anxiety and rumination; Moulds et al., 2007). These results suggest worry and rumination each function as a form of experiential avoidance, through focusing individuals on the verbal content of distressing material, limiting its emotional impact (Moulds et al., 2007). It could be argued that Cognitive Behavioural Therapy (CBT) techniques (such as cognitive restructuring) may be ineffective at times to treat rumination and worry, as it promotes verbal processing, and has the unintended effect of blocking the emotional processing needed to challenge dysfunctional beliefs (McEvoy et al., 2015). High residual rates of rumination and worry following CBT for depression and anxiety suggest that this may not be an effective approach (Watkins, Mullan, Wingrove, Rimes, Steiner, Bathurst, Eastman, Scott, 2011).In contrast, Borkovec (2004) advocates for the exploration of further emotive techniques designed to access and modify threat schemas on an emotional level, to effectively treat rumination and worry. 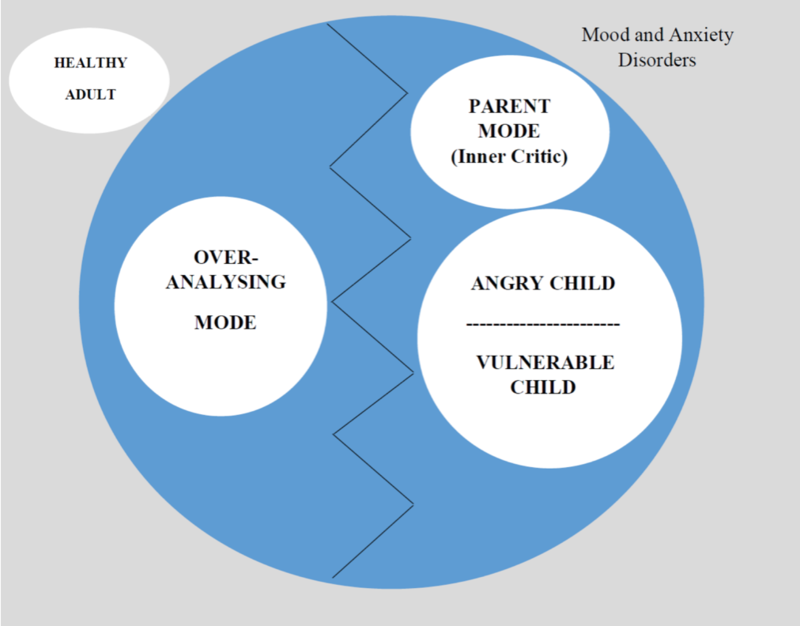 Borkevic’s model of worry and rumination has overlap with Young’s Schema Mode Model (2006) which similarly conceptualizes maladaptive coping as ultimately functioning as experiential avoidance. Further, there is an increasing body of evidence that Schema Therapy mode formulations are effective in the treatment of chronic and treatment-resistant presentations, which do not respond to standard cognitive-behavioural therapy (Hawke &Provencher, 2011). Study two extended these results by examining the relationship between the schema modes, experiential avoidance, rumination and repetitive negative thinking in 129 adults who completed an online survey. Similarly, correlational and mediation analyses revealed that the relationship between the schema modes, rumination and repetitive negative thinking was mediated by experiential avoidance. These findings are consistent with the CBT literature on repetitive negative thinking, and the notion that rumination and worry may function as a maladaptive coping mode (‘over-analysing’) with an ultimate avoidant function in response to aversive emotional states (angry child, vulnerable child, inner critic modes). These findings support a hypothesised model of mood and anxiety disorders as displayed in Figure 2. 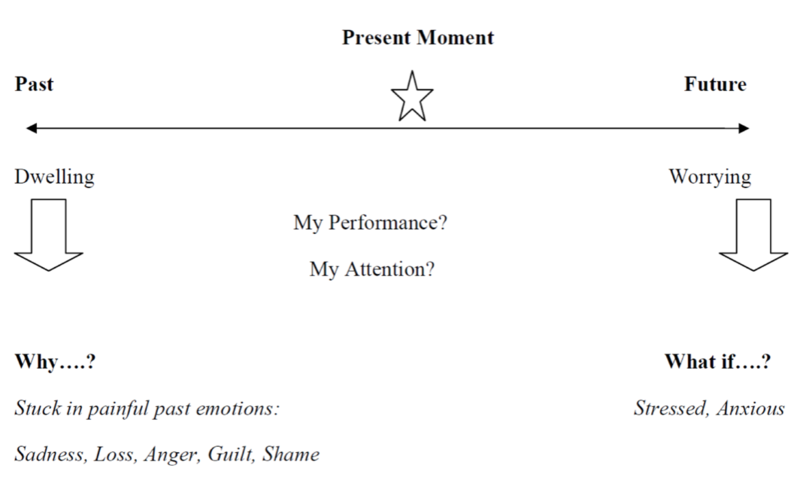 This model suggests that when faced with triggering events (thoughts, emotions, images or urges) which threaten to evoke emotions of vulnerability, anger, or shame/guilt (inner critic state), an individual may engage in ‘over-analysing’, characterised by verbal-linguistic analysis (repetitive negative thinking about past or future events), which reduces awareness of aversive emotions and reduces physiological arousal. Through operant conditioning ‘over-analysing’ becomes negatively reinforced, causing its escalation over time. Furthermore, through inhibiting emotional processing of the triggering event, over-analysing impedes problem solving, which leaves personal concerns unresolved, triggering further repetitive negative thinking and causing an escalation in symptoms over time. We propose that an ‘over-analyser mode’ can be defined as a state in which there is a focus on the verbal-linguistic processing of past and/or future events (in the form of rumination or worry), at the expense of attending to experiential and emotional features of present experience. As the over-analysing mode functions to block emotional processing of threat schemas, this may result in the maintenance of the underlying schemas and ongoing problems in need satisfaction. The present findings need further research but suggest that rumination and worry can be conceptualised as a coping mode with an ultimate avoidant function, and thus repetitive negative thinking states (e.g. worry and rumination) can be clinically formulated in Schema Therapy as an ‘Over-analyser’ coping mode. As this hypothesised coping mode takes the form of ‘over-doing something’ (thinking), we suggest that it may be best thought of as an over-compensatory coping mode, albeit with an ultimate avoidant function. As such the goal of schema therapy for these patients in session would be to bypass abstract, verbal linguistic processing in session (over-analysing) though the regular means of increasing mode awareness, pros/cons, labelling, and attunement etc, so that the therapist can connect to the underlying feelings and schemas and provide healing via emotive interventions and limited reparenting. Conceptualisation of this mode also opens the door for exploration of so called '3rd Wave' techniques such as mindfulness as a way to help patients limit their over-analysing and spend more time in the present moment where they can be more attuned to needs and feelings.